Jillian Phillips reviews 2017 horror film, "It," and compares it to the 1990 original version. 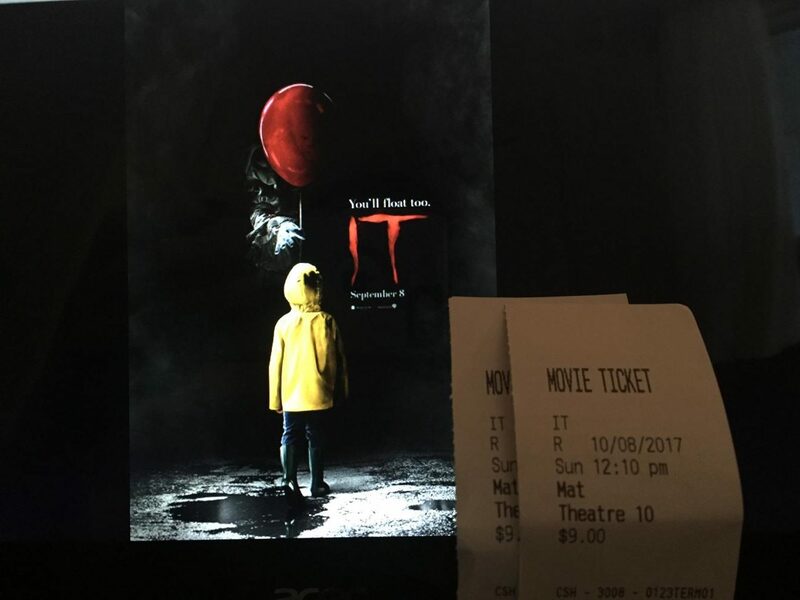 Filled with fears and phobias, red balloons and a murderous clown, the 2017 remake of It leaves audience members questioning the actuality of their own worst nightmares. Upon entering the theater, one can find two different types of audience members. Reserving their seats in advance, the typical movie buff anxiously awaits to compare and contrast the 2017 It to the 1990 original version. I, however, fall into the other crowd of audience members who wish to relive the horror. With Halloween just around the corner, I thought what other way to prepare than re-watch the remake of my childhood’s worst fear: the 1990 original version of It. Directed by Andres Muschietti, It follows seven outcasts on their mission to terminate an evil, shape shifting demon that masks itself as a clown. The “Losers Club” is lead by Billie (Jaeden Lieberher), who is struggling to cope with the murder of his younger brother, Georgie. The club also features new kid Ben (Jeremy Ray Taylor), jokester Richie (Finn Wolfhard), young practicing Jew Stanley (Wyatt Olef), anxiety ridden Eddie (Jack Dylan Grazer), and innocent Beverly Marsh (Sophia Lillis). After several terrifying visits from the clown, the “Losers Club” bands together to complete one mission: get rid of It. My favorite part about this movie was surprisingly not the scare factor, but the development of characters. Often times in scary movies I find that script writers lack focus on character development. This was not the case in It, as audience members see a bit of each of the characters lives’. This is crucial for the movie plot because each character battles with their own fears and phobias. By getting to know each character, audience members are able to connect their fears to the events that come into play in the movie. Not to mention, some hilarious dialogue gave comedic relief and kept the audience laughing throughout the film. The movie only had one flaw, and it seemed to be more of a personal preference. Pennywise, (Bill Skarsgard) seemed to be a lot less scarier than the original, played by Tim Curry (The Rocky Horror Picture Show, Home Alone 2, Charlie’s Angels.) Curry seemed to grasp the creepy feel of a psychotic clown in the 1990 film, while Skarsgard sticks to a high pitched voice with a toothy grin. I found myself bored during the scenes that were supposed to terrify me by the murderous clown. The 1990 version of Pennywise also looked more human and real, while the 2017 remake depicts Pennywise as almost fake. However, Skarsgard does a great job of making the clown look more scary by his build and height of 6”4! The intense ending of the movie had audience members clinging onto their seats, anticipating chapter two of It. Audience members can look forward to seeing the “Losers Club” back together, 27 years later, in chapter two for the return of Pennywise. Altogether, chapter one earns 4 out of 5 stars.